The Great War in Europe claimed its first local casualty: Paul Lindley, 23, of Addy. 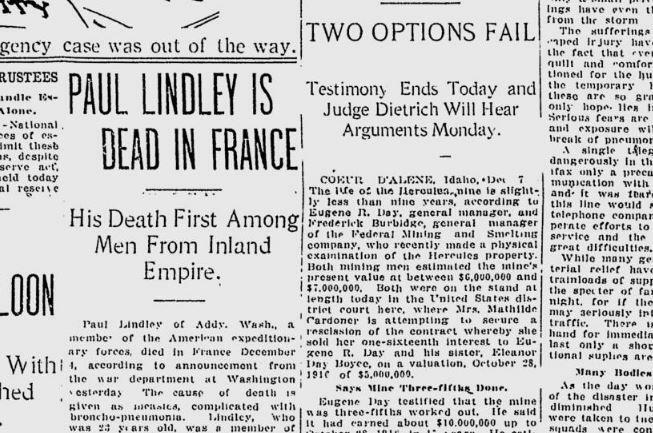 Lindley was a member of the engineers corps in the American Expeditionary Force in France. His death was not a direct result of combat; like many of the war’s casualties, he died of disease, exacerbated by the hardships of trench life. “His death is the first to be reported of any men who enlisted in the Inland Empire,” said The Spokesman-Review, not counting local men of Canadian or foreign citizenship who had gone to war years before the U.S. entered the war. Lindley had been in the service only two months. He had trained briefly at Fort George Wright and a camp in New York before being sent to France. Also from the war beat: A front-page editorial cartoon was scathing in its indictment of the region’s trainmen, who were threatening to strike unless they received a wage increase.